A few years ago, the Stumptown Vegans openly wished for access to Ethiopian food downtown, and it came true with Small World Cafe. Sadly, their stay wasn’t a long one, and the void returned. With the exception of the limited Saturday Market offerings from Horn of Africa (who has full size restaurant definitely worth checking out on NE MLK), it’s puzzling that in a city this food cart happy, Portland didn’t see an Ethiopian cart come for the lunch crowd – or late night, for that matter – any sooner. Regardless, Emame’s Ethiopian has opened downtown and despite pleasantly smelling berbere on my hands for the rest of the day, I’m one happy devourer of lunchtime lentils. 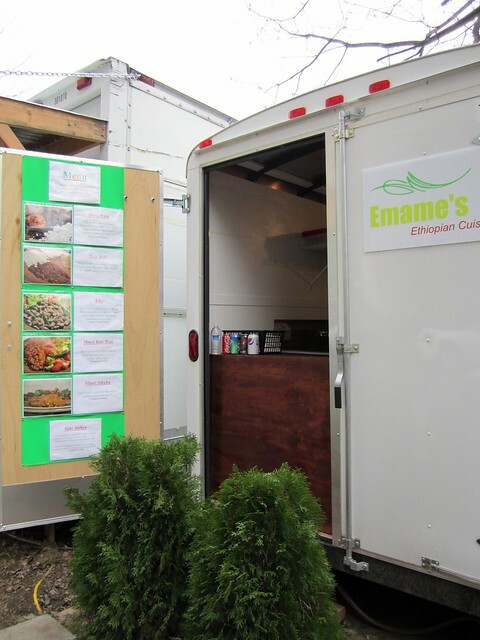 Emame’s cart sits on the southern border of the cart blocks on SW 9th between Alder and Washington. To its left, neighbors fairly vegan friendly tapas cart Mono Malo; to its right, well, I forget, but it’s probably a Mexican or Thai cart. As you can imagine and have probably seen, there are plenty of neighbors with vegan options, such as Savor Soup House, The Whole Bowl, and another New Taste of India. 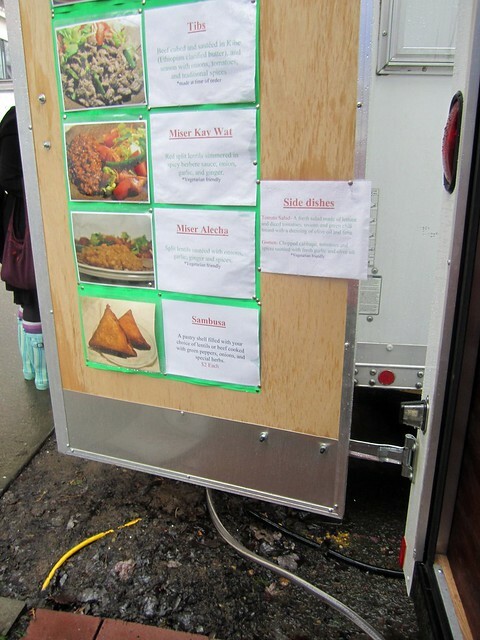 Now, why is it so shocking that Portland’s lunch scene had yet to see an Ethiopian cart? Frankly, the menu features a few dishes that are intentionally stewed all day. 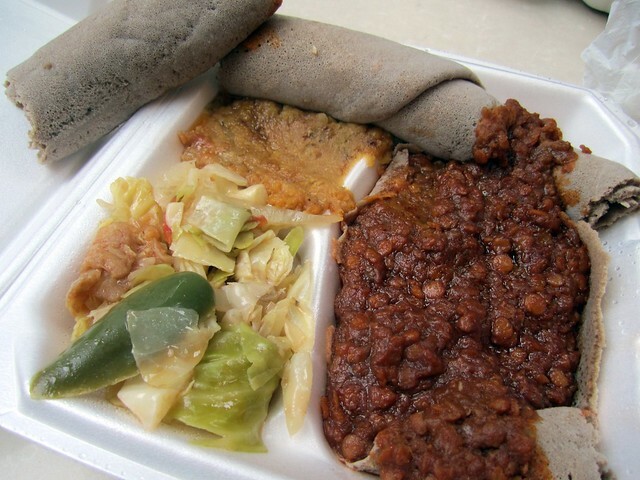 Emame’s menu includes two primary vegan entrees: stewed, spicy red lentils with the deep, growing heat of berbere, onions and ginger, Miser Kay Wat; and the mellower porridge of yellow split lentils, Miser Alecha. Prior to my second visit, I had been craving their particular Miser Kay Wat for weeks, and it lived up to its satisfying memory. The Miser Alecha is more mashed than versions I’ve tried elsewhere; if there was a touch of sweetness, I’d almost believe there were mashed yams in it. 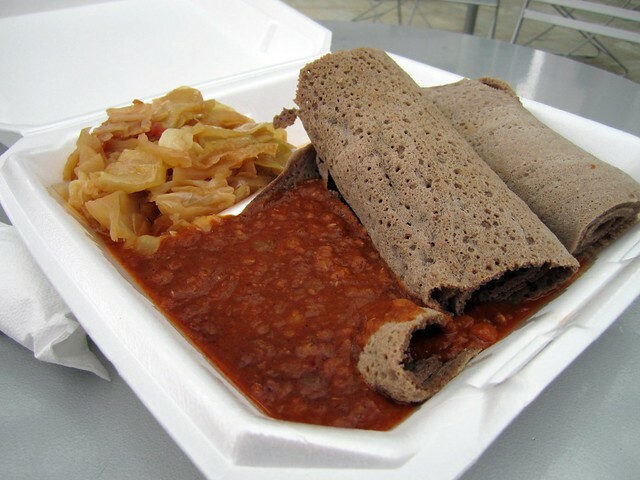 Both main courses are available as part of lunch plates ($6), which come with a side and their dark and airy gluten-free injera rolls for scooping. If the thought of this terrifies you on your lunch break, as it almost did with me, don’t sweat it – you get a plastic fork and napkins, as well. On both my visits, the side provided was Gomen – sautéed green cabbage with mild peppers and hints of chili and coconut oil. If you’re an oil avoider, you may want to ask to substitute a side salad. The cart also offers housemade Sambusas stuffed with hot peppers and even more lentils. The sweet chef offered complimentary samples of the vegetarian (it’s vegan!) sambusa pastry to my friend and I as we waited on our last visit, and while room temperature, the flaky crust and earthy, spicy filling made me highly consider this $2 add-on on a future visit. This particular stop already involved the small addition of the Miser Alecha for $1 (that’s how strong my yearning for Miser Kay Wat was), bringing the value of my warm lunch plate of Miser Kay Wat, Gomen and injera from $6 to $7 – and as you can see below, there’s more than enough for one person, with leftovers and plenty of sharing room. Let me put it this way – I visited this cart despite a lack of an awning, mid-downpour, and was not disappointed. You see, lentils were made for this type of action. Nearby seating options include Director Park and inside the Galleria next door. I was just here and had the miser kay wat, gomen, and sambusa. The sambusa was a bit dry and doughy for my taste and the gomen was really oily, but the flavors were fantastic and the miser kay wat was as good as any I’ve had. I was really happy with my lunch! The service was fast and really friendly, too.